With thirty-year industrial experience in the space sector, Fabio Occhioni has held for several years the role of Production Director of the new state of art Thales Alenia Space plant in L’Aquila. In particular, he managed the project for the rescue, recovery and re-installation of the industrial activities of the L’Aquila site following the 2009 earthquake, as well as the definition of the Industrial infrastructure of the new Production Plant inaugurated at the end of 2013. He held international positions in Belgium and in France providing industrial support in the transformation programs based on the improvement of production processes using lean techniques. 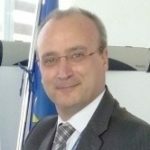 Fabio has been working with Industry 4.0 topics for several years and he has taken part in several working groups in connection to this topic and Digital Continuity. He has defined the specification of Manufacturing Execution System (MES) that has been deployed in Thales Alenia Space.